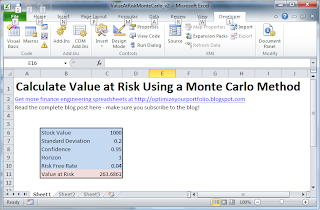 This Excel spreadsheet calculates Value at Risk through the Monte Carlo simulation of geometrical brownian motion in VBA. This post describes the code, but if you just want to download the spreadsheet scroll down to the bottom. The notation is given at Wikipedia, so I won’t cover it here. Now, in the spreadsheet I want to calculate the stock return, so I make a small modification to this equation as follows. 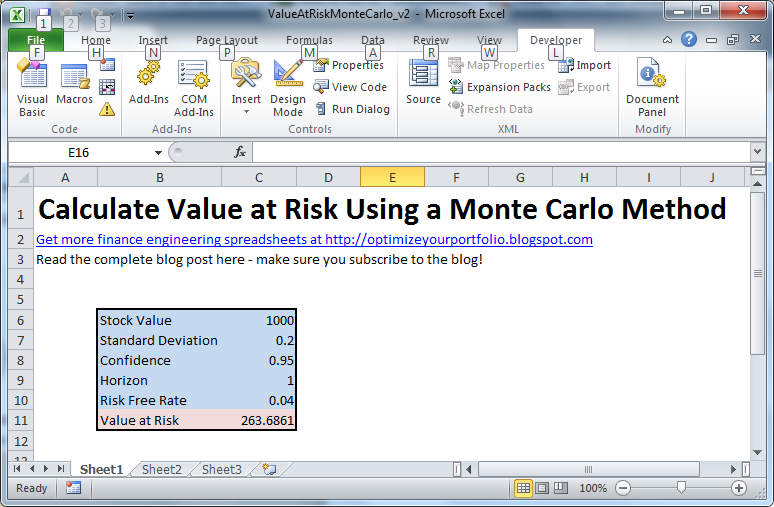 and i is a counter variable that increments from 1 to 10000, and represents multiple Monte Carlo runs. i think that the first equation is false (but the code is still correct). The equation was probably already false on Wikipedia and has been corrected in the meantime.